Sorry, and I apologise in advance: in this post I’m going to be a nit-picker. The question in hand is the Eurozone third quarter growth one, and the story is all about differences (between countries) and these differences in the key cases (France and Germany) are in many ways all about inventories. So maybe I should have titled the post “all about inventories”, following Pedro Almodovar’s cinematographic lead in cycling and recycling that old “all about Eve” metaphor – necessity is the mother of invention, and movements in inventories are progenitors of both growth, and of that notorious double dip difficulty. So just which one of these is it that we have on our hands here? Indeed, the fact that the devil, as always, lies in the details should not really surprise us since economics isn’t that different from other sciences, and isn’t such a difficult subject to work with – even if some journalists and lot of bank analysts are able to make it look like it is by managing so frequently to make a dogs dinner out of what should really been an ever so plain, ordinary, and simple vanilla-flavoured ice cream. Let me explain. 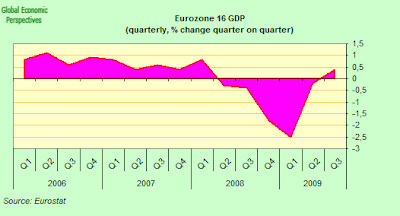 Before getting bogged down in all that horrid detail let’s register a very simple plain, evident, and totally undisputed item of fact – the “eurozone sixteen” economy (whatever that rather nebulous concept actually refers to, when you dig down a little below the surface) poked its nose timidly out of recession in the third quarter of this year, with gross domestic product in the 16 countries using the euro rising 0.4 percent from the previous quarter (see chart below). This return to positive headline growth technically brings a recession which lasted five consecutive quarters of shrinking output to a close – even though output was still four percent below that registered in the same period in 2008. So evidently we are out of recession, but are we out of the woods yet? Well, basically I think we aren’t, and to explain why I think we aren’t I’m going to pick (yet one more time) on poor old Frank Atkins of the Financial Times. It almost hurts me to do this, since I am not trying to say that Frank is an especially bad example of economic journalism (far from it), even if he is sometimes very badly served by his headline writers, writers who over the weekend managed to switch what was Friday’s declamatory “Germany powers eurozone recovery” version (and for those who like twitter here) to Sunday’s much more modest “European recession ends with a whimper” one. However since this is now the second time in just over as many months that Frank has wheeled out the German economy “powering” something or other word out, I cannot help concluding that either he really likes the expression, or that he must know something I don’t about what is actually going on in Germany, since structurally speaking it would seem to me that such “powering” is now completely impossible, given the economy’s evident export dependence. Thus far from powering up anything, the German economy is always – in some significant and non-trivial sense – going to be “powered” by someone or somewhere else. The thing about Frank is – in Eurozone economic terms at any rate – he is both geographically very close to where the action is (ie in Frankfurt), and communicationally very much in touch with thinking in Brussels and Frankfurt, which is what always makes what he has to say interesting, at the very least. On the other hand, since the journalistic consensus seems to have shifted over the weekend – quite literally from a bang to a whimper – we might really want to ask ourselves the tricky question of whether we still think the rebound is as strong as it was first made out to be. Well, here we have two facts – the Germany economy did grow by 0.7%, and growth in the French economy was below consensus expectations – and one opinion, that the growth represented a sharp acceleration in the German recovery. In fact, in France output expanded by 0.3% in the third quarter, a very similar pace to that seen in the second quarter, but significantly below consensus expectations which were for a 0.6% growth rate. So you could say, rather than being disappointed I should have been rather surprised on the upside by the outcome, since growth at 0.3% came in higher than my expectation (0.2%). But truth be told, I really wouldn’t want to make this claim very strongly, since I was in fact practicing what we Catalans call the ancient art of “trampa” (astute trickery), sin being intentionally excessively prudent in order to outperform, and also trying to shift attention away from the short term headline number issues about this quarters French GDP number to the longer term issue of what happens to monetary policy in a “Eurozone 16” if France recovers significantly more sharply than everyone else. Before continuing further, I would also make a second point, one which I think is pretty relevant to the whole debate about where the Eurozone actually stands in the here and now, and that is that my most recent piece was actually written about the OCTOBER PMI data, that is I was already looking ahead and talking about prospects for the fourth quarter, whereas Friday’s release was actually backward looking, and taking us back in time, in order to revisit not Brideshead, but economic data from the third quarter in an attempt to get a better picture of what was happening back then, even if, as we are now about to see, since Friday’s release was only a “flash” one, we still lack most of the detailed breakdown which would enable us to do just that. So in many ways Friday’s news was already history (which makes it even more surprising how consensus interpretations have shifted over the weekend) and what really interests us is what is happening now, and where the current so called “recovery” is actually heading. And just to rub our noses right in it, we could remember that a week on Monday (23 November) we will have the Markit Flash PMIs for November (and this will already give us two thirds of the fourth quarter data to play around with, which should help us come up with quite realistic estimates of what eventual GDP will look like). Thus, despite my openly professed French “bullishness” I do want to stress that I am only expecting modest growth again from France in the fourth quarter, but the important point we should expect this growth to be sustained going forward, and it is this that makes France so different from much of the rest of the Eurozone, since France has the capacity to generate autonomous (endogenously driven) growth in consumer demand and it is precisely this feature that makes the French economy so special (in the Eurozone context) at this point. Anyone looking for dramatic (sustained) surges in the any of the advanced economies at this point is, basically, living on another planet (possibly, I suspect, the one we are all being expected to send our exports to). 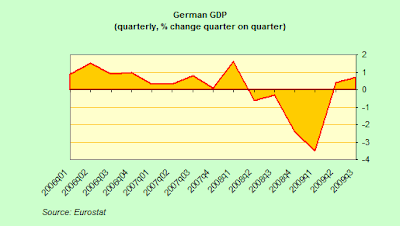 Now if you look at the chart below, you will see that German growth was in the second quarter was, more than anything, a statistical quirk which resulted from a balancing act between strong swings in inventories and in net trade. In the third quarter, as far as we can see (since we don’t have that ever so important detailed breakdown), this position has quite literally been inverted, as the earlier trade bonus has been eaten away by growth in imports (largely to stock up on export oriented inventories, not items destined towards domestic consumption) and this part we more or less know, since we do have all the trade data in for the quarter. Now the Nomura people say “with domestic private demand still very depressed”, but, I’m sorry, if you take a look at line three in the table, which shows quarter on quarter household consumption, you will see this is stable, and up. In fact France has not shown one single quarter of quarter over quarter contraction in household spending during the whole crisis. This is what I mean when I say robust. Now you could say that this is all about cash for clunkers, and to some extent you would be right, but other countries have had cash for clunkers programmes, and domestic consumption hasn’t held up anything like as well, so the outstanding issue for economic theory, and for eurozone monetary and fiscal policy, is why, why does the French economy and none other exhibit this profile? 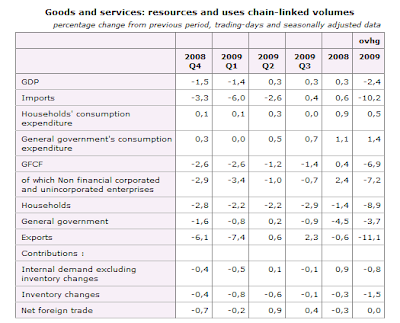 Now you might want to argue that French household consumption was stationary in the third quarter (and this is what many of the analysts point to), but I would respond by pointing out it is still well up on consumption in the third quarter of 2008 due to the earlier quarters of growth. OK, so we don’t exactly have a consumption boom (yet), but is anyone really expecting one at this point? Even in Norway? All I am saying, and saying almost boorishly, to the point that it irritates, is that French consumption has the potential to rise in the coming quarters, while German consumption doesn’t, and this is going to be the key FACT about the Eurozone in the months and quarters ahead. And if you find economic at times a boring and tedious subject, then I’m sorry, sometime things are just like that. Look at the next to last line in the table. French inventories fell by 1.5% quarter over quarter. So, to put things plainly, the real difference between those headline GDP numbers for Germany and France is that Germany increased inventories while France ran them down, and government spending in both cases played a large part in the growth. The thing is, in the fourth quarter it is quite likely that Germany will have to run down some of those inventories, while France may start to increase them. Either way, I repeat, at this point French growth (even if at a tortoise pace) looks a lot more robust and a lot more sustainable than growth in any other Eurozone country, and if things turn out as they appear to be, then we will one more time need to be asking ourselves just what it is that is wrong with “convergence theory”, since whatever the actual reason behind the present Eurozone divergences, the plain fact of the matter is that they exist. My estimation is that Italy’s long term trend growth at this point is not far from zero, and indeed it is quite possible that Italy could have its third consecutive year of negative growth in 2010. Italy’s growth problems are well know, structural, and long term, and have little to do with the current crisis, so any argument about Italy powering anything very significant at this point, is bound to be skating on thin ice. And then, of course there is Spain, which isn’t getting too much mention, but which is consistently likely to pull the Eurozone 16 aggregate growth number down going forward. FT Alphaville’s Tracy Alloway draws attention to a summary of the situation from JP Morgan economist David Mackie which seems pretty much to the point. So, going back to my original question, is this a whimper recovery, or are we on the verge of a double dip? 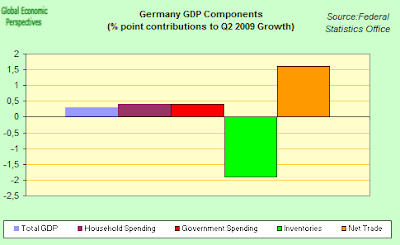 I think, basically, it is all down to Germany, and those inventories. If external demand weakens in key customer countries then Germany will fall back into negative growth, and with it the whole “eurozone sixteen economy”. Since demand in the South and the East of Europe is hardly going to be strong, given the new found need of countries in those regions to run trade surpluses, my inkling is that just this outcome is now a clear possibilty. So while the consensus at the moment seems to be that France disappoints, my view is that it is the German economy we really should be worrying about. Why is France seemingly the only Eurozone country capable of domestic consumption-led growth? But I would say that these factors mainly support short term outperformance of the French consumer market. Over a longer period I would not necessarily agree that the French economy is the only one in the Eurozone that will have a strong domestic consumption element at its core. Basically for the sort of reasons Will gives, plus Franceâ€™s very positive demographics. Consumption driven economies (as opposed to economies where consumption simply rises in association with other factors, like investment for export) depend on consumer credit increases. France has a higher proportion of people in the relevant age groups for borrowing than most other Eurozone countries, plus debt levels did not rise too high during the last cycle (as in Spain), so France is ready to assume a higher level of private indebtedness. I would stress I am not saying that this is all positive, since what we are seeing is increasing structural distortion in the French economy (as we have seen in other consumption driven economies last time round), with a decline in manufacturing share, and a slow but steady loss of international competitiveness. In economics you can seldom find â€œfree lunchesâ€. If you want more explanation see my last post on the French economic linked in the post above. You wouldnâ€™t like to advance a list of possible candidates would you :)? Edward, to what extent is the French,”tortoise-like” economy a reflection of the (still) high levels of public service employment? Such employees have retained their jobs (and spending power). M Sarkozy is, of course, intent on replacing only 1 in 2 of those retiring, or otherwise leaving their service. But those retiring will receive (guaranteed) pensions, whilst those leaving for other reasons will, presumably, have paying jobs to go to? Whilst the high level of public employment may be helpful in the current crisis, it has been shown to be a drag on economic expansion in normal times. In Austria, the houselhold consumption shows a robustness comparable to the french situation, though Austria’s economy is much more open and dependent to the international conjuncture than the french one. Thanks for the analysis. It is uncommon to read intelligent things about France in the economic mainstream media. This seems incompatible with standard theory since (1) French economy growth, including internal demand, is much higher than that of the neighbours (or, more accurately, falls at a slower rate) and (2) the euro is overvalued. As an aside, it is the opposite in the UK, where a competitive devaluation of 25% and a higher shrinkage of the economy than the environment did nothing to improve external trade. Do you have clues regarding this conundrum? Thanks for the detailed review! I read fistfulofeuros solely because of your posts 🙂 However you almost never write about Switzerland. Can you comment on the state of the Swiss economy? It is a major european financial hub, so it would be very interesting to find out how it is doing in times of a crisis.